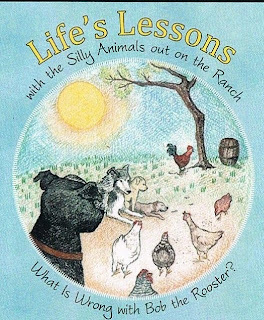 Title: Life's Lessons with the Silly Animals out on the Ranch- What Is Wrong with Bob the Rooster? Book #3 is filled with many lessons which involve medical issues. As a child with a heart defect, I remember going through medical procedures and test which left me with scars that saved my life. Told through one of our hens, that in fact, has a scar. With a sense of humor and colorful illustrations, she tells the story to her animal friends, about how she came about her scar and the medical procedures she went through. She realizes the scar is what helped her to have a normal life and how the medical staff made her feel safe. This story has many lessons. More stories about other test to follow. Dedicated to my parents, my family, my friends, and all the medical staff that took care of me. My husband and I have five children and two grandchildren. We moved from our home on the Florida Panhandle to New Mexico for his job on the base. Another adventure in life. We bought a small ranch, bought some animals and having fun with the country life. I have worked in the medical field for most of my adult life and now writing a new chapter. By Valerie Allen "Author: Write, Publish, Sell!" What Is Wrong with Bob the Rooster is the first book in a series for young children by Cindy Crawford Garrett. The series, Life's Lessons with the Silly Animals out on the Ranch, has positive social themes. The focus in this story is following the rules and what can happen when we do not do so. It highlights a positive team approach, with the animals using their skills to help Bob the Rooster out of a difficult situation. The illustrations are cleverly done in crayon, which is appealing to young children. It is a good read-to-me book or for the beginning reader. This book is a good story, with delightful characters that kids, parents, and teachers will enjoy. Why did you write this book? This was my first book, In hopes to reinforce a lesson of consequences for actions therefore if you go somewhere or do something you are told not to there might be problems. Anything in particular you'd like to share about this book or it's creation? This was an actual event when I noticed our rooster had string wrapped around his legs although my husband actually cut the strings off. What can we expect to see from you in the future? I have two other books out as of to date. I am working on two more now, one is actually the values of work in our country which involve around our animals conversation. Another about a nightmare which was actually a dream. I have lots more stories which there are a lot of lessons to teach and to install in our children. These books I have written and am writing are simple and to the point which I believe are easy for children to understand. Interested in my work and services? © Copyright 2016 Jo Linsdell. Designed by Bloggertheme9 | Distributed By Gooyaabi Templates . Powered by Blogger.